Additional Info: Pure seminoma accounts for 50% of all germ cell tumors. They usually occur in young men, with a peak incidence around 40 yeats of age. This image shows uniform appearing cells with a moderate amount of clear cytoplasm, defined cell borders, large central nucleoli, and clumped chromatin. Mitoses are usually present (but not seen in this image) and may be abundant. Most have a lymphoplasmacytic infiltration as is seen here. Features of other germ cell tumors may be present. 5% of seminomas have syncytiotrophoblasts (but no cytotrophoblasts, which would indicate choriocarcinoma). Same exact histology in ovary is termed a DYSGERMINOMA. Immunohistochemistry can be helpful in the diagnosis: Placental alkaline phosphatase positive, HCG, AFP, high MW CK negative (HMWCK distinguishes from embryonal carcinomas which are also EMA and CD30 unlike seminoma). Syncytiotrophoblasts may be HCG positive. Seminomas have a good prognosis. They are extremely sensitive to radiotherapy. For Embryonal Carcinoma see [Ref #1]. Arrow #1 shows tumor infiltrating lymphocytes. 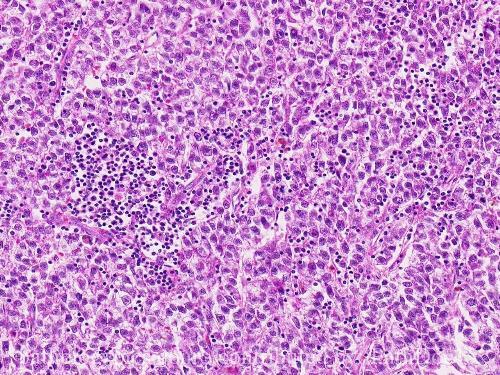 Arrow #2 shows a neoplastic cells with a prominent central nucleoli. nice reference function! Spermatocytic seminoma is PLAP negative, but histologically, there should not be confussion between the two. Anyone out there with a pic of this rare tumor that they are willing to post? Oops - There IS a mitosis on the right hand side of the images (look at the larger image and arrow to see more easilly).